Clothing/Jewelry Description A gray hooded sweatshirt or coat, and gray leggings. Distinguishing Characteristics African-American female. Black hair, brown eyes. Stubbs's ears are pierced. 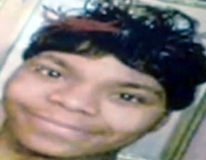 Stubbs was last seen on April 24, 2014, when her brother dropped her off at 3rd Avenue west in Birmingham, Alabama at 9:00 a.m. She was meeting a man at Boost Mobile so he could help fix her car's brakes. Surveillance video showed Stubbs getting into the man's burgundy 2012 Chrysler 200. She has never been heard from again. The man Stubbs met on the day of her disappearance was an African-American man in his fifties, someone she knew only by sight. He had met her at her job, and she offered to help him braid his children's hair in exchanged for help with her brakes. He is a person of interest in Stubbs's disappearance, but his identity has not been publicly released. Stubbs left behind two young children. Foul play is suspected in her case, which remains unsolved. Updated 3 times since October 12, 2004. Last updated March 28, 2019; picture added, clothing/jewelry description and details of disappearance updated.